The school holidays are nearly upon us … if you’re like me, I want to make the most of any bright or sunny days to go out with my children. But often I’m struggling for ideas – and by the time I’ve browsed the internet for ideas on what to do, it’s lunchtime, and we haven’t even got out the door. For the Easter holidays, prompted by the excitement of the arrival of Shaun the Sheep, I have done my research in advance. And it seems only right and fair I should share these ideas with you too. (If you’re using national rail services, don’t forget many trains are not stopping at London Bridge while there is redevelopment work in progress – best to check in advance for disruptions that might affect your train journey.). Remember the simplest things are often the most fun for children: flights of steps, buses, parks, getting wet and running around. My children are really excited about the new Shaun the Sheep trails. There will be 120 giant Shaun the Sheep sculptures, created by artists, designers and celebrities, grazing green spaces and iconic locations across London. The first 50 arrive on 28 March and they’ll be here until 25 May (they then move onto Bristol). As well as a helpful trail map, there’s also an App you can download. Visit the National Gallery is in Trafalgar Square in central London. Very convenient for Charing Cross station and a delightful bus ride or tube journey from the other mainline stations. You’ll find a selection of audio tours and printed trails for families. My children love the British Museum – there are so many interesting galleries and exhibits to visit, for grown-ups and children alike. We always make a beeline for the Egyptian gallery first. Visit the Young Explorers section on the website for activities and trails. Visit one of the City Farms – there are several all over London including Mudchute, Stepney, Hackney, Kentish Town and Coram’s Fields. If you’re near the Southbank Centre, take a wander along the river, across the Millenium Bridge and over to St Paul’s Cathedral. 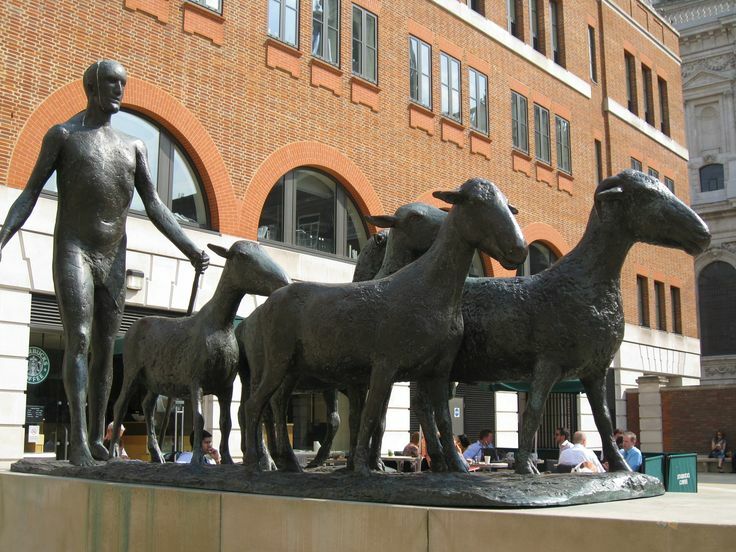 It will no doubt be a busy time for Cathedral visitors but even if visiting the cathedral is not your ideal activity (and it’s certainly not free), do take time to explore Paternoster Square. My children LOVE the statue of the sheep. Have you thought about taking a trip on a London bus? We often come into London and just jump on a bus without a clear idea of where we are going. Many routes pass the famous landmarks (some great suggestions here). And, quite honestly, children just love sitting on the top desk of a bus and watching London go by. Visit the TfL website for details. Alternatively a ride on the Docklands Light Railway where children LOVE to sit at the very front – look out for the Danger of Death signs. (OK these may not be completely free, depending on the age of your children). When it’s a warm or sunny day, we love to visit More London. There you can wander around Hay’s Galleria, picnic in Potters Fields Park, admire Tower Bridge (bridge lift times), The Scoop and kids will love the fountains! Which of these ideas will you go for? If nothing here inspires you, then check out more Easter activity ideas here. I’d love to know where you go. Glad you like it – when you’re looking for fun with your kids, no matter where you are, simplicity wins out every time. I’m saving this, Sherry. My trip to London was work related and then my colleague twisted her foot and that put paid to our sight-seeing plans. I’ve promised myself a long visit to the UK and Ireland someday and this post will help! Shame about your sightseeing plans … you definitely to plan a fabulous long visit to the UK. Hope this list is helpful then. I’ve been saying to hubs that we must visit the Tower and St Pauls. Not been since I was a kid. I just LOVE London soooo much. Southbank, the bridges, Westminster Cathedral, The Wheel, the gorgeous architecture, river trips, old buildings in the City of London, the parks tucked away in the City and West End, Mayfair and the historic buildings around there (and the parks!) .. The grand hotels (Claridges, The Ritz!) .. Burlington Arcade. The buzz of Soho on a summer’s evening. Theatre land (haven’t visited for faaar too long!) .. The fun of shopping (visited last summer for the first time in years) … The foot of Regents Street (some great bars/music venues) .. Some of the towering venues that offer views across the city that look magnificent from day through to dusk and night. I’m out of touch now and visit more rarely. We went to see the poppy display last November. 1000’s of people. No problem! A great and poignant display and so worth visiting. LOVE LOVE LOVE London! Thanks Sarah – London is a fabulous city. We love visiting and our girls love it too.